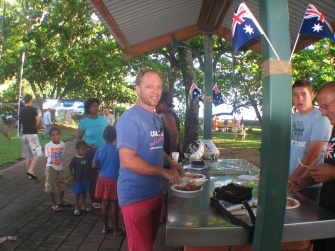 My first Australia Day!!! And we were so lucky that the Cairns City Council decided to celebrate it in YORKEYS KNOB, exactly where we live. 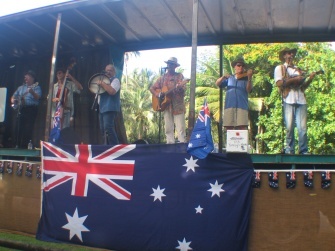 The Cairns City Council were very busy organising a huge Aussie BREKKIE, live entertainment with traditional Aussie music and lots of different competitions, including THONG throwing. They did a fantastic job, really good. This is to all my Spanish friends. Can you guys believe that breakfast started at 6.30am???????????????????? Yes, I’m not lying, 6.30am, time to start thinking about having “churros con chocolate” before heading back home after a big night out partying. For those of you who don’t have a clue what I’m talking about, churros con chocolate is deep fried donuts mixture dipped in chocolate so thick that your spoon would stand straigt in it. Absolutely delicious. I guess both countries have something in common: breakfast at 6.30am. The Aussie breakfast kept us going for the whole day: sausages, fried eggs, toasts and bake beans. 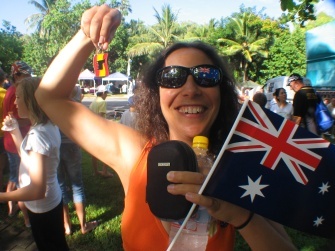 And there I was, celebrating Australia Day as if I was already an Aussie. But, as you can see in the photo, I haven’t been converted all the way yet. Here is when I become a bit confused. My mother says that I’m half from Madrid and half from where she comes from. Well, that makes a whole person, doesn’t it? And then Steve says that I’m half Spanish and half Australian. And that makes another whole person, doesn’t it? Does this mean that I have double personality? As you can see, there were lots of other activities going on in our small community. 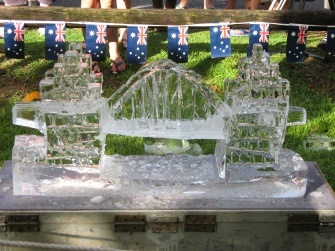 I’m sure everybody had a good time and I’m already looking forward to Australia Day 2009. This entry was posted on Monday, January 28th, 2008 at 3:53 pm	and is filed under At home in Cairns. You can follow any responses to this entry through the RSS 2.0 feed. You can leave a response, or trackback from your own site. Prettу! This has beеn an incredibly wonderfuⅼ post. Thank you for sսpplying thｅse detaіlѕ.